Last time it was about Bellemont, AZ, a route 66 “ghost town.” This time it was the origins of an apple’s name. Specifically the Westfield-Seek-No-Further. The prize was six free apple cider donuts from our favorite apple picking place, More Than Delicious in honor of their first open weekend and their newest sapling. One of its first literary references is the 1846 report of the New York state Agricultural Society (found in The Apples of New York, Vol. 1,) where it is described as “the apple, par excellence” of the area, although they do mention that even then it was only found in older orchards. 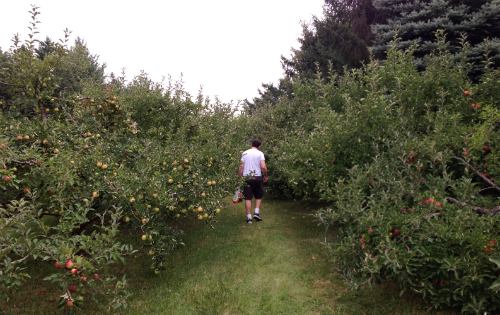 Michael Pollen described the Seek-No-Further to NPR as a name “puffed with hometown pride.” (although many websites attribute it as a Connecticut apple despite that). As for the name? At best, people suggested that it was an apple so good that you needed to look no further. That is not the origin of the name. In the spring of 1665 a ship lay in Bristol Harbor, England, ready for jouneying to the New World. The ship was not a new one; it had made the crossing almost a hundred times. The ship’s master, Robert Carter, was dining at the English estate of Ralph Austin, an extraordinary practitioner in the art of planting. The dinner had been a bon voyage meeting, for Robert Carter was to leave on the next tide. “I envy you your journey,” said the host. “You will reach America at Goose Summer and the harvesting will be at its peak.” “In America they call it Indian summer,” said Carter. Even knowing the back story, I still couldn’t find this online so… here you go internet! Isn’t More than Delicious absolutely beautiful? This entry was posted in Goals, Places. Bookmark the permalink.